Cute, cute, cute! I love the name too, I might just have to steal it and put it on my list! 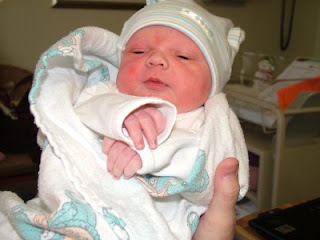 Jay here and just a small correction, Callen was born on Feb 21st. I don't know who he looks like but it definately is a Merritt so he's got that going for him. God forbid I make a typo between the 9000 words I type everyday. I posted on the correct day, though, so I got that going for me. Love you, so I'll fix it. And, for the record....he looks like REESE!